As of today I have been keeping For Love of the Table for six years. (Hard to believe...I know....) On the occasion of my first anniversary I posted a cake—it seemed the obvious thing to do. It was an unusual and delicious pistachio cake. Over the years—for no reason other than they were the star of that first anniversary post—I have made a tradition of posting a recipe on March 16 that features pistachios. More often than not, it has been cake (I do love cake). Even when it has not been cake, it has always been something sweet. 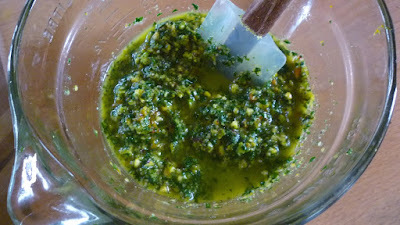 But this year, I thought I would change direction a bit and share something savory: a delicious and versatile sauce. The main ingredient in the sauce is of course pistachios. 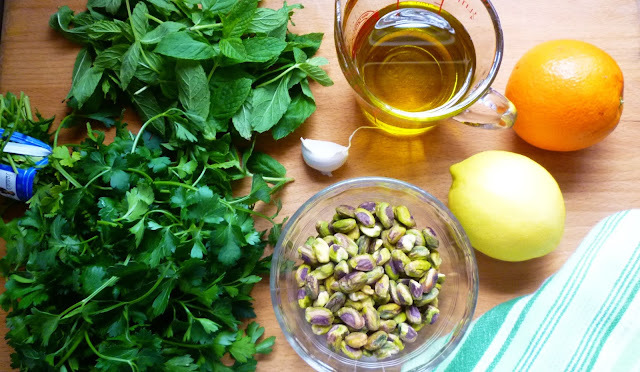 Pounded in a mortar and pestle and combined with parsley, mint, citrus zest and juice, the pistachios become a rich, lively and intriguing sauce. It makes an excellent accompaniment for fish and seafood (halibut, salmon, scallops...). 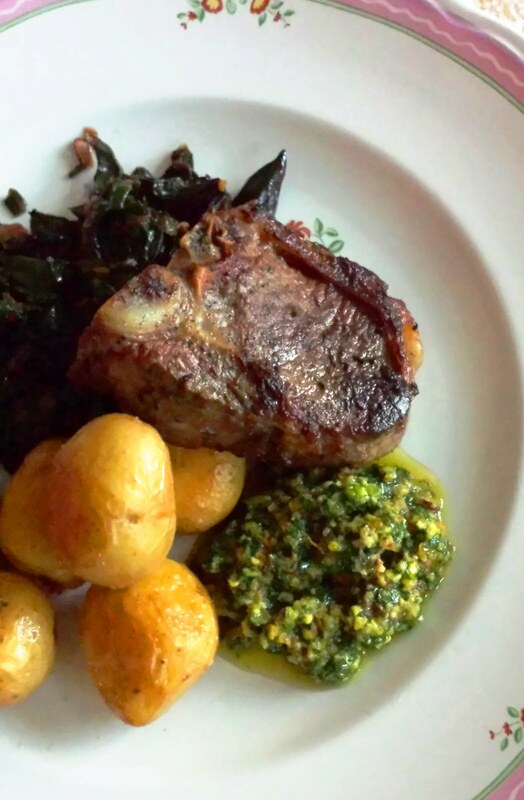 And it also goes beautifully with lamb, chicken or vegetables. 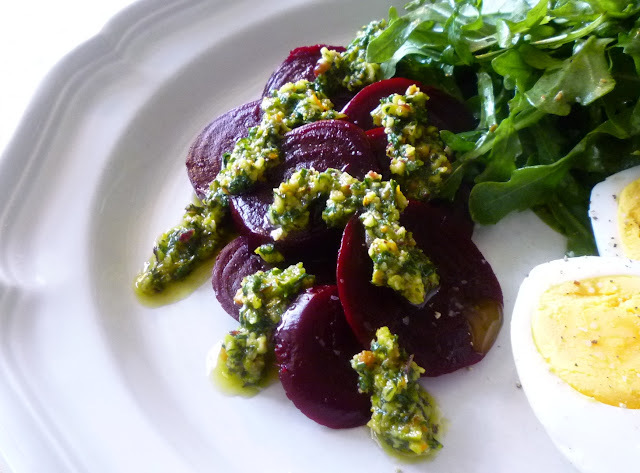 Beets are particularly fine drizzled and daubed with this sauce...as are potatoes and asparagus.... Because of its beautiful green color, I particularly love serving this sauce in the spring and on into early summer. 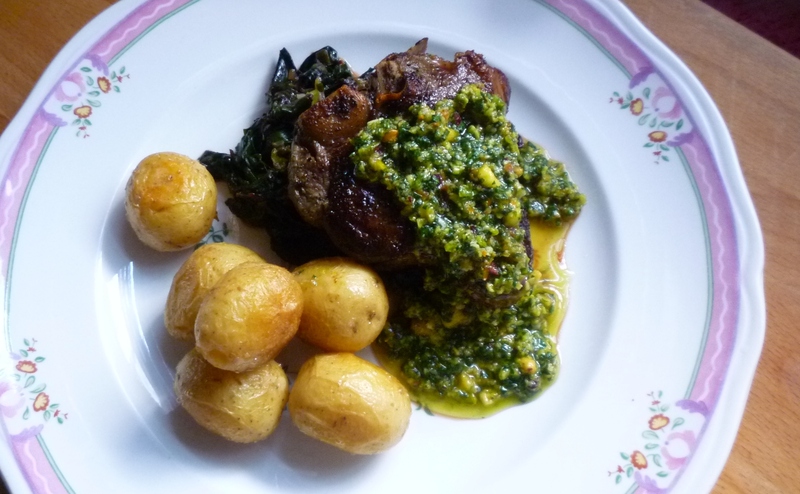 My sauce is an adaptation of one I found years ago in Moro: The Cookbook. Moro is a restaurant in London featuring the foods of Spain, North Africa and the Eastern Mediterranean. The original recipe included orange blossom water...a delicious, floral and aromatic flavoring agent from that region of the world...but not something I tend to keep on hand. My sauce includes orange juice and zest instead...and while they are not really a substitute for the orange blossom water, they add nice orange flavor. The original sauce had only a small amount of mint, but I have increased it by quite a bit...making it a main flavor element of the sauce. But like all herb, nut and olive oil based sauces and pestos, you should feel free to alter the flavorings and quantities of ingredients in this sauce so that it suits your palate and marries well with whatever you happen to be serving it with. The sauce is also delicious with the addition of a small amount of toasted and ground fennel seed...and I think that a few hot pepper flakes would not be out of place. I would only recommend that you use a light hand with the garlic. You can always add more...and just a bit too much can overwhelm the sauce. As my anniversary has approached this year, I have been thinking quite a bit about where my blog has been... and where it is headed. When I started, blogging was in the forefront of my mind most days... Now it is more of a quiet companion—a silent partner in my working and cooking life. I have reduced the number of posts substantially from that first year when I was posting a recipe every three days or so. Now, I shoot for one a week...sometimes more if I'm feeling particularly inspired....sometimes less if I'm super busy. In terms of content, I still love to do "basic technique" posts....I just don't have the time to do as many as I would like. But I will continue to try and squeeze them in as my schedule permits. I have posted...and will continue to post....recipes that I have developed for my classes. Many of the posts will continue to be things I love to eat on a regular basis...simple, seasonal recipes that are heavily influenced by the cuisines of France, Italy, Spain and occasionally... as with today's post...the Eastern Mediterranean. And of course there will always be lots of pasta and cake. Over the past year I have wondered if perhaps it is time to say good-bye to For Love of the Table. But even as I consider this, I realize that I have appreciated having a place to record the things I'm doing in the kitchen. Although I started keeping a blog for others, a wonderful bonus has been that it has become my own personal cooking notebook. If I can't remember why I did something a certain way....or why I added a particular ingredient....or exactly how I cut something...or how thick a batter should be... you get the idea... I can look here and find out. I love that. So...for the foreseeable future...I will probably keep it up. Going forward, if I could change one thing about For Love of the Table, it would be something I don't really have any control over: I would love to hear more from YOU!...those of you who read...and those of you who cook from this site. I truly enjoy hearing back from people who have made something...and liked it...or had questions...or made changes.... The comments on For Love of the Table are set up so that I screen them first (to avoid spam, etc. )...but I usually post them within 24 hours and try to respond in that length of time. You can of course always comment on my Facebook page too. So, whether you are a regular...or an occasional visitor...it would please me very much to hear about the ways in which For Love of the Table affects your life—in your kitchen...and at your table. Chop or crush the pistachios to the fineness you prefer with a knife, in a mortar & pestle, or in the food processor. I like the texture achieved by chopping to small pieces and then crushing in the mortar. This gives a range of textures—small chunks and powder fine. Transfer to a small bowl and add the remaining ingredients. Adjust with lemon juice, orange juice and olive oil. If desired, thin with water.